Just received our copy of New Trail magazine with illustration by Monika Melnychuk. Another terrific assignment with the award-winning team at the University of Alberta. This issue of New Trail explores how the alumni is solving everyday problems. i2i Art is proud to introduce illustrator Angelica Yiacoupis--the latest addition to our roster. Based in North London, Yiacoupis graduated from the London College of Communication with a degree in Graphic Design and Illustration. Her infographic style, combined with her light-hearted humorous nature always makes a bold statement. Angelica loves to develop characters (and alternative worlds inhabited by them). Her passion for animals and the environment are also recurring themes in her work. See Angelica Yiacoupis' complete portfolio. Proposed Campaign for Orange, mobile and Internet company, UK. Meet Vera the Explorer! An enthusiastic crusader created for the promotion of Aloe Vera Products. Below a very cool mascot designed for Mad Grads' Student Planners, for Nottingham and London Universities, comes to life as the character illustrates aspects of student life. Recently we shared some of Mark Hoffmann's new work and the response was fantastic! We didn’t want anyone to miss out on his brilliant illustrations. Check out Mark Hoffmann's portfolio, get inspired and commission an illustration by this super talented illustrator! Greg Stevenson recently worked on a large, yet to be unveiled project which featured this clean line art style. Feeling inspired by this and his love of Paris, Greg has created this map/infographic of Paris and spin-off poster designs. To see more visit Greg's portfolio here. Clare Owen has a way of taking even the most dry material and making it look nothing less than lovely! 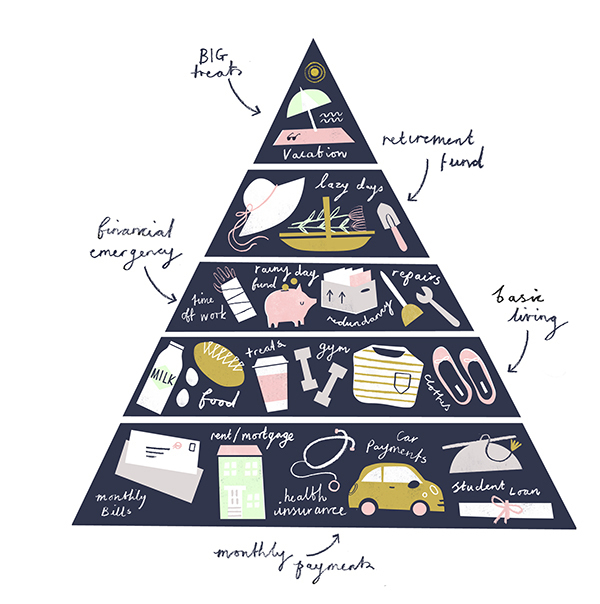 When approached to illustrate a feature about Building a Budget (Without Breaking a Sweat) for Verily magazine, Clare developed this fun and informative infographic. With the help of this little chart, I think one could easily do it, no sweat! She actually makes is look fun! To see more of Clare's charming infographics and other delightful illustrations, check out her updated portfolio here. Ian Phillips maps a tasty treat! Persian's are a delicious treat Ian encountered in Northern Ontario. Fascinated by the phenomenon, he illustrated this map highlighting where Persian's can be found. Ian says, "Legend has it that sometime in the 1930s a Mr. Bennett baked the very first Persian in honour of a guest visiting from the Middle East. A conflicting story declares the delicacy was named after its American cousin, the Pershing, which was named after General Pershing. Others claim the Five Star Bakery originated the special treat as a means to sell day-old cinnamon buns. Debate over the secret ingredient in the icing — whether it’s raspberry, cherry, or strawberry — also continues to this day. Although Persians now abound throughout The Lakehead region, confrontations over which bakery produces the most authentic pastry have created a permanent melee throughout The Great Northwest." To see more of Ian Phillip's maps and other illustrated treats visit here. Combining Greg Stevenson's hand lettering, info graphic icons and layered photo-illustration adds a fun, upbeat mood to these stories of courage, art directed by Stephanie White. In this recurring feature, called A Year of Firsts 2014, meet and be inspired by the people who embraced a whole year of trying new things, whether facing fears or embracing change. Peruse more of Greg's illustration here. Art director, Paul Bonsell of Manifest Communications had a vision to create a light-hearted infographic to illustrate the serious business of the Get Cyber Safe web campaign sponsored by the Government of Canada. With his vivid imagination and fun style, Ian Phillips was just the illustrator to deliver the faux pirate's map! The infographic's goal is to help the general public get smart on Phishers who lurk in the deep waters of cyber space, gathering personal information--banking info, credit card numbers and passwords etc. For more information visit getcybersafe.ca.